01182013_Becherer_Pakistan008: Global News Events: Global News Portfolio: New Orleans based Photojournalist covering the Deep South and beyond. ISLAMABAD, PAKISTAN. 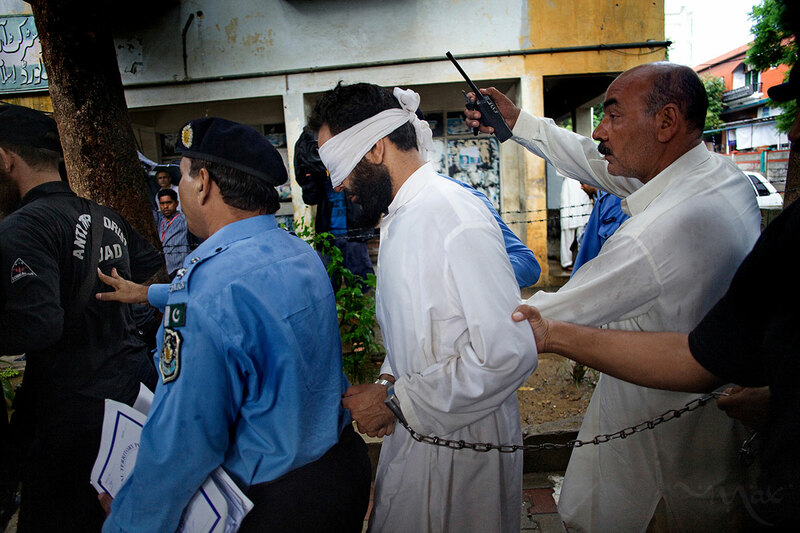 Imam Hafiz Mohammed Khalid Chishti is blindfolded and shackled as he is led to court to receive formal charges for falsely accusing a young Christian girl of burning pages of the Quran at the Islamabad District Court in Islamabad, Pakistan on Sunday September 2, 2012. The Imam was arrested after his deputy made a statement saying he saw the Imam add pages to the burning ashes in order to accuse the girl of blasphemy and expel the Christian family from the neighborhood. The case involves Rimsha Masih who was arrested on August 16, 2012 on charges of blasphemy after being accused of burning pages of the Quran by a crowd of her Muslim neighbors. The girl, who is believed to be between the ages of 11 to 14, and her family were roughed-up by the crowed before being taken into custody by the police.